You mention from the beginning that this book is not an ethnography of language but a critical reflection on language revitalization research. Was this your plan from the very beginning? What was your approach to writing this book, starting from your original research to envisioning what the final product of this monograph would be? Well, the book does result from ethnographic fieldwork, but in the end this is not how the book was framed, for a number of reasons. The main reason, then, was that I was looking for ways to interpret what I was observing, and I could find no satisfactory approach. I guess at the time I needed a framework to understand what language revitalization was, what it was about, and back when I started my PhD 2006 the two main currents were either works on endangered languages and, soon afterwards Heller and Duchêne published Discourses of Endangerment. I found neither approach entirely satisfactory, so I felt that, to paraphrase Bourdieu, I needed to constitute and problematize my own object, rather than be constituted by it. Hence the largely historical parts that seek to retrace the emergence of a reflection on language revitalization in linguistics and anthropology on the one hand, and the parts that try to retrace the birth of a language movement in Southern France roughly from the 16th century onward. 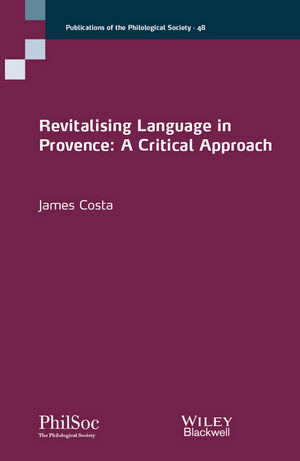 It was only then, I felt, that I could say something worthwhile about what people were doing with language in Occitania, from a perspective that was my own and not that of language endangerment or critical sociolinguistics in the sense of Discourses of Endangerment. Since this is not a traditional ethnography, how would you like readers to approach your monograph? What quickly struck me as I was writing my dissertation was the multiplication of language revitalization movements across the world. And I came to think that because the Occitan movement was over 150 years old and had been so well documented by sociologists, linguists, historians and so on, maybe some of its mechanisms and some of how it had been constituted could serve to understand, if only partially, other such movements. So I wrote the book backwards, starting with the ethnographic part, which comes last in the book, and then the more theoretical parts, which come first. It thus reads as a series of hypotheses and proposals about language revitalization that are then tested against what I observed in Provence. What I was really hoping to get going was a conversation about language revitalization, one that continued the conversation initiated by Ralph Linton and Anthony Wallace in the 1940s and 1950s about what it means to appeal to certain aspects of the past, here language, to construct the present and dream a particular future. Perhaps my hypotheses are incomplete, some might not work at all. But what I tried to do was to evade the for-or-against revitalization dichotomy, and propose questions to approach situations of revitalization in various parts of the world. To what degree has your approach and critique of language revitalization research largely been informed by ethnographic fieldwork on language revitalization movements in Europe? I agree with you that there is a strong European bias to my book, but this is also because language-based social movements have historically emerged in Europe both as a result of Romanticism and as a calque of what dominant nation-states had achieved with the languages they promoted as their own. Also, as I pointed above, there is a lot of historical documentation about European movements that can help us understand the dynamics of revitalization in general. For several years, I collaborated with colleagues in Mexico who worked on similar issues and on indigenous language bilingual education. Our conversations were fruitful and while clearly the cases of, say, Zapotec and Occitan are very different, we found many areas of convergence, in particular in the internal conflicts within language movements over orthography, language denomination, and the ambiguous role of cultural elites. Another point which I think makes sense in both Europe and the Americas is the idea which I develop, but which I borrowed from a 1974 paper by Margaret Sanford, that revitalization movements use elements that are likely not to be primarily important locally, but that are likely to make sense to the dominant groups to which they are addressing claims (for land, recognition and so on). So basically, what the Occitan poets who initiated the revitalization movements were trying to do was first establish legitimacy to speak in the name of the South (and to assert the existence of a legitimately different South), and second, in order to do this, to use categories that made sense to the Parisian elites they were addressing—in this case language, the basis of French culture. “You have a language, so do we.” “You have a prestigious literature, we have the Troubadours.” “You have a coherent, standardized language? We will too.” In this respect, one can therefore ask: when indigenous groups reclaim their language in the Americas or in other parts of the world, are they doing so because they “are made aware of the importance of their heritage,” or are they using categories that have been rendered legitimate by institutions such as Unesco as a way to gain recognition? Isn’t it easier to gain recognition through culture than through labour right demands or land claims? After all, it might be easier to achieve the latter through establishing cultural recognition first? This might never happen, but at least promoting one’s language is now an internationally recognized way of existing. While you are critical of language revitalization/maintenance practices and related studies, your monograph nevertheless highlights several common theoretical themes that speak to linguistic anthropologists and socio-cultural anthropologists at large. These common themes include the question of social othering (especially heightened in language revitalization movements) and shifts in social categories and boundaries in these social movements. Considering these broad, central themes to the field, what are some of the main takeaways for linguistic anthropologists and anthropologists in general upon reading your book? First of all, language revitalization is not all that different from other types of revitalization movements, cultural, legal, religious. In that sense, the main question this raises is: “Why language?,” rather than something else. Second, the multiplication of such language-based movements worldwide can raise questions both in linguistic and sociocultural anthropology, such as: “Why that now?” This also accompanies the rise of religious revitalization movements, and if one accepts, as I propose, that such movements are not inward looking, but on the contrary outward looking, that they address groups which they identify and view as dominant (and, for that reason, potentially threatening), this raises questions about the current phase of modernity and about what it means to be “a minority” group today, whatever elements are used to give visibility or construct those minorities. Revitalization movements, in other words, are not peripheral, they are not stones in the shoes of progress, they address the very core of the Modern world. Consequently, they say something not only about minorities but also about majorities, or about how majorities are imagined, and they say something about the composition of a common world—or, as the case might well be, the lack thereof. What I am saying, then, is that those movements, and their multiplication, should be taken seriously—not as a series of romantic or backward-looking fads to be extolled or condemned, celebrated or dismissed, but as the manifestation of something deeper, which could engage many disciplines in trying to understand what the very categories of “majority” and “minority” mean today. Sanford, M. (1974). Revitalization Movements as Indicators of Completed Acculturation. Comparative Studies in Society and History, 16(4), 504–518.